Aspinalls - Whitworth Art Gallery - Manchester - UK Engineering Experts | Engineering Business UK | Qualified Engineers Lancashire | Mechanical Engineered Products | Mechanical Engineer Services. 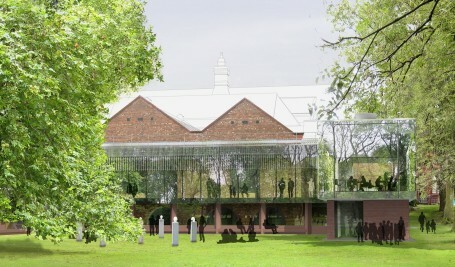 The extension creates a new North Wing which will embrace the park and houses a Landscape Gallery where Whitworth’s internationally important artworks will be displayed. Alongside this will be new study centre where visitors of all ages will be able to explore and learn about the gallery’s wonderful collections. A promenade gallery will lead to the South Wing, comprising a new café and a Learning Studio opening into the art garden. Simon Aspinall - Director, commented : "We are excited to be involved with this project, the mullions are a very unique detail that help to create a really special, interesting, architectural effect. This is the first project we have undertaken for the main contractor ISG and it is our aim to forge a lasting relationship. It is a pleasure to be working with the project Architects again, MUMA, who we previously worked with in 2011 at the V&A Museum, London."